Can it get any worse ??? VU Television launched yesterday… and today the PPS closed at .0002. That is down 50% from yesterday. This is not good ! Last week we had news that the ClearVision airport deal was only going to bring in 19 thousand a year/airport instead of the much publicized 192 thousand year/airport. This difference is not chump change as they say. Now, yesterday, there is a post on Investors Hangout that indicates Mr. Samblis will not be growing the business any more than it already is. Are you serious??? What kind if business owner states he is done growing the business? If this information that was posted about the airport deal is accurate, one needs to ask themselves… why, after multiple opportunities to correct the amount, did Mr. Samblis remain silent on the issue. Mr. Samblis has posted about specifics on the airport deal numerous times, and long after that figure was widely publicized and posted about, yet he remains silent even now about the figure. He has not confirmed or denied either figure. This is misrepresentation of material facts pure and simple. One needs to assume by his silence on this issue that the 19k figure is the correct one, or he certainly would have refuted the posting suggesting the 19k amount was accurate. Some time ago Mr. Samblis stated he would not post on message boards any longer, we suspect, because he thinks information can be misrepresented, and his words twisted against him. He now only posts on his Facebook page… the one he controls! From recent reports, many of the less-than-favorable comments posted on Facebook are being removed. So, it appears Mr. Samblis favors censorship over letting posters voice their opinions. If someone were to post a question about the discrepancy in figures on the airport deal, such would likely be deleted, along with any other less-than-favorable information. Does Mr. Samblis think that by deleting the tough questions and criticism that people will think everything is rosy ? Does Mr. Samblis think that potential investors use Facebook as their first and only vehicle for DD on companies? Mr. Samblis… running from, and hiding the truth, is not a winning strategy for a successful business ! The newest revelation that Mr. Samblis will no longer expand the business is the most troubling statement. Again, what kind of business owner makes a statement like that ? His company’s PPS closed at .0002 today… and he states he has no intentions of expanding the business. That statement, in our opinion, is simply irresponsible. The company has not shown a profit, ever, and for the last 2 quarterly reports has shown no revenue…. and Mr. Samblis makes a statement indicating he will no longer pursue company growth. This is just inexcusable ! Its likely the worst statement he has, or could ever make. We, along with many others, have said Mr. Samblis needs to stop making public statements and hire a professional public relations professional. He likely thinks he can’t afford to do such, but its obvious his public statements are costing the company a lot more than hiring a professional would cost. In fact, a professional would likely earn their salary many times over, and be the best investment this company could make at this point. As they say… when you’re in a hole… stop digging ! Mr. Samblis… you need to stop digging ! 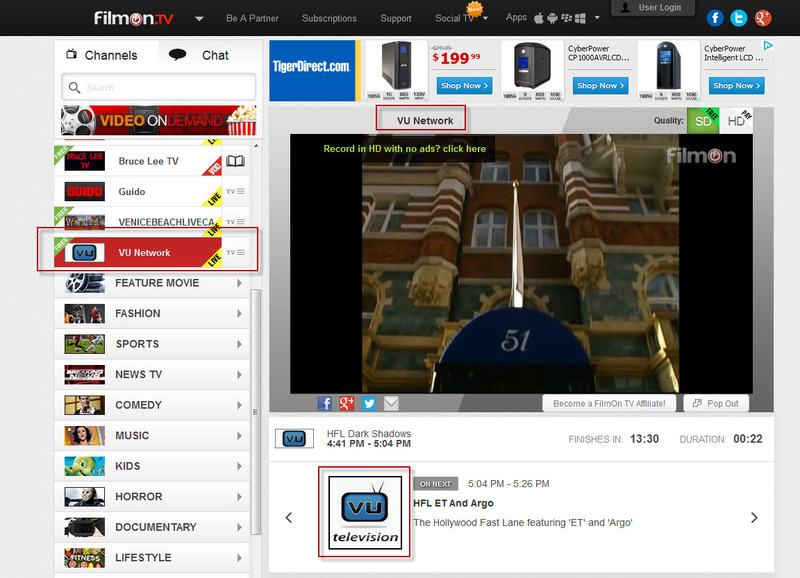 Well.. looks like VU Television Network finally launched today (October 29, 2013) on the FilmOn TV web network. The quality of the picture appears to be fairly decent, however its not the quality of a good HD TV. Certainly watchable though. The functionality is there to “pop-out” the picture so that you can watch the content full-screen. Its not really full-screen, however certainly better than the little square as seen below. Content quality is up to the viewer, however certainly what we watched was able to hold our attention for a while. Time will tell the tale here regarding the repeating of content, or content that is not able to hold one’s attention for any sustained period of time. Overall… the VU Television Network is not bad for a start-up network. Now… will it make any money? That’s the big question. To investors, nothing matters but revenue. While we watched, and granted we did not watch for hours on end, but none the less, we saw no ads. That could be a problem. No ads… no revenue! However, the network just launched and its assumed advertisers will follow… hopefully ! The lack of ads was puzzling, because we seem to remember Mr. Samblis saying, prior to the first missed launch date, that he had advertisers lined up for airing from the very beginning. Once again, maybe the ads will be added shortly… hopefully ! Another thing that was puzzling, and concerning, was the lack of a broadcast schedule. Perhaps it was there and we simply missed it. A schedule could soon follow maybe. Also, although there are several instances of the VU logo on the page, there is no VU logo inlay in the content itself. We seem to remember there was a logo inlay into the PunchTV content when it aired. This is not a big deal, however one would think a broadcaster would want viewers to know where the content came from in order to help them find it again if they thought the content was worth returning to later. Overall… we are not disappointed with what we saw. We understand this is the first day of broadcasting and improvements will likely follow soon… hopefully! So, although its not perfect, it is indeed a glimmer of hope that maybe… just maybe, this VU thing will blossom into something. As we posted in one of our recent posts… hope is not a plan, so we are watching closely for any glimpse of potential here. Hopefully Mr. Samblis understands that you only get one chance to make a first impression. It is recommended he tie up the loose ends very quickly, before the bashers poison the jury pool. Yes folks, there are only 4-days to “Launch” day for the VU Television Network. Does anyone (including the investment community) know this ? Well, if they follow the IC Places Facebook page they might (see the attached graphic). Other than that, it’s doubtful anyone knows, because there has been very little released about the launch or network in general in traditional press releases. Given the lack of promotional activity surrounding the impending launch, some have begun to question the motives behind the network. Is the network a real business venture, or simply a self-indulging ego trip for the CEO, Mr. Steven Samblis. Some have suggested Mr. Samblis is more focused on socializing with movie stars and playmates, then creating share value for investors. Some suggest the company being public is simply the vehicle that allows Mr. Samblis to maintain his fantasy of being a movie star himself. There certainly is enough data to support this suggestion. Will the network “launch” as published this time? It looks as though it might, based on the Facebook posts to date. There has been slightly more activity leading up to this launch date over the last (missed) launch date. However the activity level (at least the public activity) is insufficient to create any excitement about the launch. And, as mentioned above, given that the public promotional activity has been limited to Facebook, what little there has been is likely seen by very few. We suspect there might be a (traditional) public press release either the day of, or the day following the actual public broadcasting of the content. However, as we have previously commented on in this blog, we feel this critical time leading up to the launch has been squandered with regard to creating public awareness and excitement over the new network. Think of it this way… if you have a new business venture of making a new car… you better be spending some capital and energy telling people what is different about YOUR car over the many other cars already out there. Broadcasting is a very crowded business. VU Television will simply be a grain of sand on the beach. What is VU going to offer viewers that they can’t get in any of the hundreds of other broadcasters out there already? This question has not been answered, and certainly not publicized. Could VU Televison Network be successful… well, as a concept yes, but in practice, given the business decisions that have been previously made by this CEO… its questionable at this point. And therein lays the problem for current investors holding large amounts of company stock. Most CEO’s could have by this time in the business cycle created enough buzz about the business venture (stock) to have created a run up in the share price purely on speculative revenue generation, future profitability, and probable success. However this CEO, Mr. Steven Samblis, has squandered opportunities to do such, and has made previous decisions that have negatively impacted any “good will” value the business had. Many now question his abilities, and his creditability, to be able to deliver future revenue and growth. In spite of Mr. Samblis’s previous history, can he make this network successful? No one knows, and that is why the PPS is where it’s at (.0003 as we write this article). The current PPS should be an embarrassment for any CEO worth their salt. Most CEO’s would have faced their investors, apologized profusely for the PPS, and laid out their plans to improve such. What have the investors received from Mr. Samblis… excuses, finger pointing, abuse in some cases, and overall silence. Not exactly actions that investors expect from the CEO of the company where they have their hard earned dollars invested in. So… the launch will likely not produce the rise in PPS to a level most investors hope for. There will likely be no new investors until such time that revenue can be documented, and the CEO can redeem himself in the eyes of the investment community by producing solid documentable performance and results. At this point, the only thing remaining is hope. And you know what they say… hope is not a plan ! China deal – another disappointment! Yes folks… apparently the China deal is off the table ! This was one of the most hyped achievements ever presented by Mr. Steve Samblis, CEO of IC Punch Media. See the press release here. Now, investors learn about the failed deal in an off the cuff post on Investors Hub. See the post below. Really… the CEO decides to release this news in a Private Message to a poster on a message board. After all the hype, investors need to find out about it in a thinly worded message board re-post, that some could characterize as an inadvertent disclosure, given that the CEO disclosed the information in a Private Message to a single poster. This action is way beyond insulting to investors, and some may question its legality. Given the previous promotional effort surrounding this initiative… to have the information only provided to 1 investor, in a Private Message, leaves all other investors to question what other insider information is being provided outside of the general investor’s knowledge. Mr. Steven Samblis, CEO of IC Punch Media and/or VU Television Network has been asked about the China deal countless times since the initial announcement, and there was little (if any) pertinent information provided. The questions about the China deal recently, simply went unanswered, only to say information would be released when appropriate. Well… when would it have been appropriate to release the news the deal fell through ??? Likely never we suspect. Seems that Mr. Samblis is quick to release good news to all investors, however apparently you need to be on the insider list to get the important news… the kind of news investors need when they are making investment decisions. And Mr. Samblis wonders (perhaps, although likely not) why investors feel (and post) that he has no creditability. This news, and the method in which general investor’s learned of it… is just shameful. Its likely that if this company had a real Board of Directors… Mr. Samblis would likely been shown the door long ago. Yes folks… its been almost a week since our last post (and some 19-days away from the “delayed” launch), and investors are still awaiting news, PR’s, advertising… ANYTHING ! Some are even speculating on another delay. The only thing that seems to garner investors attentions lately… is the talk of the company doing a Reverse Split on the stock. Now the IC Punch Media CEO Steven Samblis has stated numerous times on message boards that he is not doing a reverse split. That should be good enough, right? Well for many, its not. For those that think Mr. Samblis has a huge creditability problem, his words mean nothing… even if they are in writing. They would point to the many previous in-writing statements that Mr. Samblis has made that have been proven to be… shall we say… reckless with the truth. Many may remember Mr. Samblis stating he was not going to do a reverse split because “there is no reason” for it. Now some say that leaves him an out should he decide in the future to do one. All he needs is a “reason”, and there ya go… he will say he never mislead investors. What could the reason be, and/or how could the reason be sold as justification for a split? Of course, the main reason that will be cited for any justification will be… its all for the investors. He will do it for the investors, in an effort to increase share value and provide you better return on your investment. A reverse split will be sold to investors as the best single action management could take to maximize your investment. Investors will likely be told that a higher PPS will attract new investors, and a higher caliber investor… one’s with deep pockets. He will likely say… a rising tide lifts all boats, and the long time investors will benefit the most. Now, there are those that will say Samblis will never do a reverse split because it would drive away current investors. Well its pretty obvious there are very few long term investors left. Most hanging on now have lost so much of their initial investment, the only reason they are still here is because what ever little value they have left is worth the risk just in case something good does happen. They are still in it no matter of it goes to .0001 and no bid, or, goes to a dollar. However its more likely anyone in it at this point will sell the second they recover their initial investment, should that ever materialize. At this point it looks like they may have a better chance of hitting the lottery. What is worse than a reverse split… the rumor or likelihood of one. At this point, given Samblis’s creditability problems with many investors, his statements on not doing a reverse split are unable to quell the rumor of one. Most times all it would take from a CEO is to put in writing that he will not do a reverse split, but if there is a creditability problem, such does little to beat back the rumor. With no ammunition to beat back the rumor… many are free to speculate, question, and put forth their own thoughts about such. A rumor, that gets repeated and circulated across numerous message boards and other electronic media soon becomes a likely reality. When the rumor becomes accepted as a possibility, and has already done much damage to the PPS… the CEO has an easier time justifying doing the split, or doing what many thought he would do anyway. The damage has already been done, so any possible negative impact will be lessened because many will have been expecting it. So, with a lessened negative impact for doing a reverse split… it just may be a good business move to actually do one. At the current PPS many deep pocket type serious investors will not even consider investing in the stock. However, at say a PPS of around .25, .50, or even 1.00… more investors may (we say MAY) consider it, thinking its a real company with potential. However… the reality is, any serious “new” investor will certainly do some research on the company before investing, and within 5-minutes or so they will start to see some red flags. Although the higher PPS might initially attract them, the company’s history may be cause for concern, and ultimately be the deciding factor to pass on the purchase until there are reasons (profitability) to reexamine a possible investment. Make no mistake about it… we are NOT suggesting a reverse split. We think it would be bad for the stock, and company. We are only pointing out that a reverse split may not be as farfetched as some think, in spit of what the CEO Mr. Steven Samblis has stated. No matter how many times Mr. Samblis states he will not do a reverse split, his creditability with many investors has been shattered, and therefore his statements, albeit in writing, carry little weight at this point. Yes… that’s what many are asking… where’s the buzz over the (new) Launch. Its like the famous scene from Ferris Bueller’s Day Off. Only now its… Samblis…Samblis…Samblis ! Here we go again, right. A little over 3-weeks to go before the newest Launch of VU Televison Network, and where’s the buzz? Where’s the promo’s. Where’s the PR’s. Where’s the CEO Steven Samblis shouting info about the launch from the rooftops? One would think he would be doing interviews like he did for Stock Traders Talk Radio, doing ad spots on FilmOn informing the viewing public about the new network and where and when viewers can find the content. How many times do you see promos on TV telling you about a new show debuting. They give you a teaser glimpse of the content, tell you when it will be aired, and how great its going to be…. and they air the spot over and over. Where is ANY such promotion from Samblis. Could it be he has no confidence he can meet the latest launch date? Could it be that he already knows he will need to postpone again and doesn’t want to be embarrassed at having to delay once again after a promotional effort? IF he addressed any possible delay this time, he would likely say the same thing he said the last time – right up to the very last possible minute, and that is… we are on track. Most know that Mr. Samblis has experience at stock promotion. There are several articles around that reference his previous experience at stock promotion, such as this one. In fact that appeared to be how he put food on the table at one point in his life via the “New Stock” publication. Granted, that article is somewhat dated, but history doesn’t go away just because of its age. Mr. Samblis knows how to promote a company, and its stock. Now, we don’t reference his past stock promotion activities as a bad thing, even though he had some challenges with such. There is nothing illegal or sinister about promoting… in fact its done everyday by many. We point it out to draw attention to the fact he has experience in promoting companies and stocks… why isn’t he promoting his own company ??? There is a need, he has the skills… where’s the action ? Meanwhile, disgusted and frustrated investors who have lost a lot of money betting on Samblis, are sitting on the sidelines just hoping and praying Samblis will start embracing his responsibilities of running a public company and take action to increase the PPS for shareholders. They originally had faith and confidence in his words, however that faith and confidence has deteriorated significantly due to Mr. Samblis’s actions, inactions, and overall mishandling of so many opportunities to promote and improve the company and its return on their investment. Investors don’t have too much longer to wait until either the launch happens, or the next big disappointment surfaces. And… even if the launch happens as scheduled this time, as we wrote here, its likely to have little impact on the PPS. In most cases there is a run-up of the PPS just before good news is released, however there have been several opportunities for investors to buy-up the PPS in the recent past… and they have not. It seems as though there is no speculating on this stock any longer… investors have been burned so many times before, they will not buy until they see results… i.e. revenue and profits.